� Viscum Album.�This parasite rises up from the branch of the tree, on which it grows, with a woody stem, putting itself into sundry branches, and again divided into many other smaller twigs, interlacing themselves, and covered with a greyish green bark, having two leaves set at every joint, and at the end likewise, which are somewhat long and narrow, small at the bottom, but broader towards the end. At the joints of the branches grow small yellow flowers, which run into small, white, transparent berries, three or four together, full of a glutinous juice, with a blackish seed in each of them, which was never known to spring, when put into the ground. It grows on various trees in woods and groves, and sometimes on fruit trees. �The leaves dried and powdered are a wonderful remedy for the falling sickness. They are good in all nervous disorders, and have been known to perform great cures by perseverance in taking an infusion. 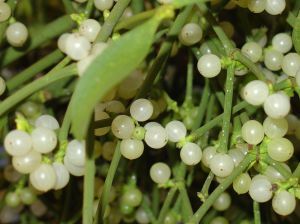 Instances of the efficacy of Mistletoe, are to be found in the writings of Paracelsus, Pliny, etcetera. The late Drs. Fothergill. Willan, Gilbert, Thompson, and Fraser, employed this medicine with great success for the cure of epilepsy. The juice, or bird-lime, softens imposthumes, ripens and heals them. Mixed with rosin and wax, it cures ulcers and sores.